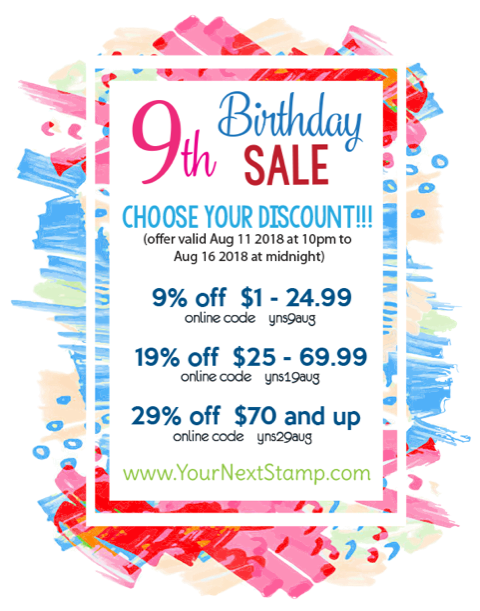 It is Your Next Stamp's 9th Birthday and we are celebrating with a Blog Hop featuring the August New Releases. And, because it is our 9th birthday, we are giving away 9 ~ $20.00 Gift Certificates to the YNS store. The more blogs you visit and comment on, the greater your odds of winning. And we have a game you can play as you view the creations made by the design team. 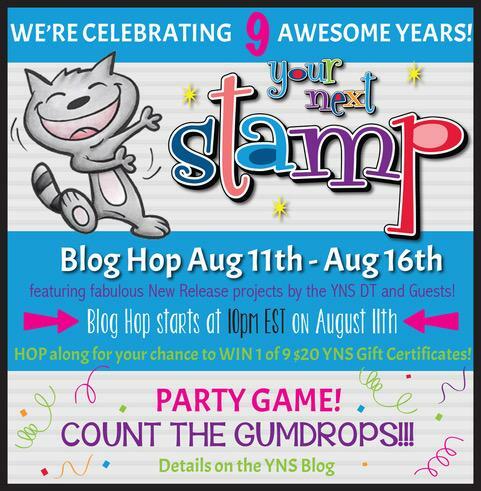 Count the number of gumdrops used on the cards and leave your count on the inlinkz on the YNS blog hop post for a chance to win a gumdrop prize pack. I personally have had great fun with this new release. I featured a sneak peak yesterday called "Hey", and you can view it here. For my card today I have used the new Cool Cats Stamp Set and a new die called Party Window Die Set. I coloured the cat with alcohol markers in shades of gray and once finished I fussy cut him out. I did an alcohol background for the cat, and cut it out using the new die for the positive and used the same die for the negative on my card panel. I attached the alcohol background using foam tape, then stamped the sentiment using Manganese Blue ink. I then styled my cat and attached him with foam dots, then added two googly eyes in different colours and a few sparkly gumdrops to finish. You can check out all the new products here, and use one of these discounts for your purchase. Have fun! Such a fun card! That cat brought a smile to my face and a little giggle! Too cute! Cool background too! What a funny silly cat! I love the way you did his eyes. Definitely a card to cheer someone! Your card is adorable ! I love the colors and your idea of the googly eyes, it's so funny ! Fantastic! That cool cat is awesome and he looks great on that fabulous alcohol background. Great card design. Great card - love the detail of two different eye colours! This is so fun!! That stamp is cute and I like the two different eye colors. I also love the fun background. Great design!! The crazy cat is adorable and what a perfect use of the ink background. thanks for the inspiration! So cute! I love the cat with the different color googly eyes! 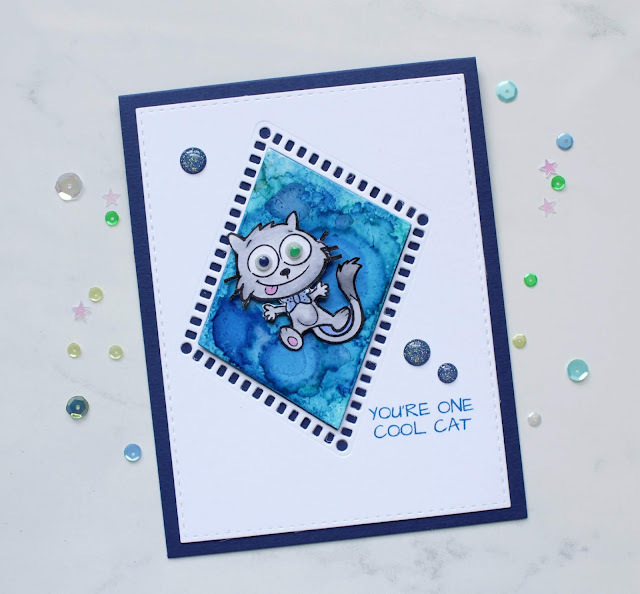 Such a fun cat image and I like your alcohol ink background. So CUTE and I love the background behind that adorable kitty! So cute! Love his eyes! Clever - love the googly-eyed cat! What a super, grin-infectious card. Very cute! Those eyes are so crazy!! So much fun! Love the colors you used and I really love the new Party Window die. I love your goofy eyed cat! What a cute card! What a fun cat card! So cute, Kia! Your googly eyes are fun!! 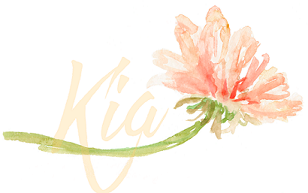 Kia, your card is adorable. I love the the party die you used and the awesome alcohol background you created to showcase the cute cat. I love this card and the eyes really make it look crazy. Cute card, love the googly eyes! Oh my gosh, fabulous card! Love the eyes! Wonderful alcohol background paired with this cool cat. Thanks for the inspiration. Fun kitty card! I like how you did the alcohol ink background. I'll have to try that. Cool cats set tops my wishlist from this release. Love the card. Hee hee hee!! So fun!!! So cool, so cute, I love it! Love that adorably sweet card and the fun die cut background you used to create your focal panel! 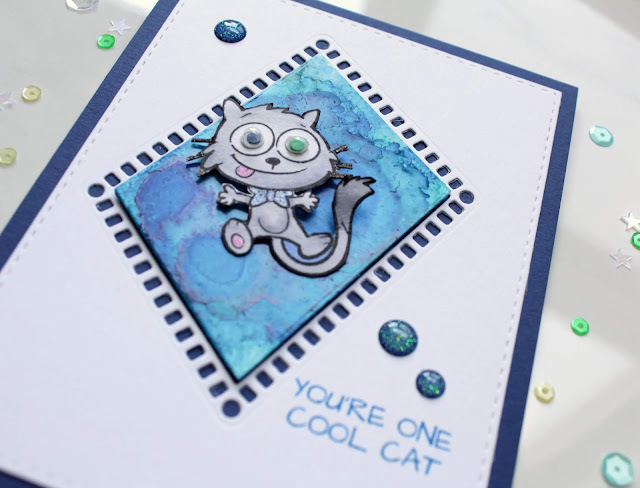 Great dies used and the cat with the wiggly eyes is so funny, nicely done! Super cute card! I especially like the cat's fun googly eyes! I love this silly cat. The cat's background is beautiful. I love the two different color googly eyes!! Nice touch!!! What a fun card. Love all the little touches with the background, googly eyes and gumpdrops! Wow, what a fun card. Love the image and your fantastic background. This card made me giggle, I love the crazy eyes! Such a pretty background! So glad to have you joining us this month! That is one crazy cat with the googly eyes. He was hitting the bar all night!